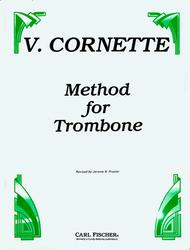 Method for Trombone composed by V. Cornette. Edited by Jerome N. Procter. For Tenor. Classical. Student book. Standard notation. 123 pages. Published by Carl Fischer (CF.CU34).ISBN 0825829453. With Standard notation. classical.